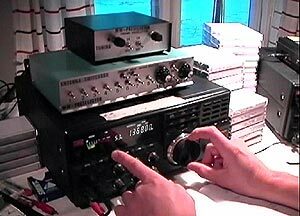 Borrowing a couple of receivers from friends, we had a total of four JRC NRD-535s and one JRC NRD-545 DSP. 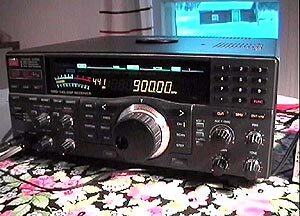 Additional equipment included amplifiers, antenna tuners and antenna switchboards. Both had a switchboard designed by Roland Sandberg to select the antennae and, if necessary, to split a particular antenna between two receivers. An "active splitter" was used to divide all the essential antennae between the listeners. This season the Lemmenjoki cabin was equipped with 12 beverage (terminated) or longwire (not terminated) antennae. Most of the antennae needed to be split between both users when conditions focused on a particular region of interest. For example, there was only one good antenna for the U.S. East Coast, one for the Iberian Peninsula, one for both the Southern and Northern parts of South America and so on. Since our antenna splitters were able to handle a maximum of nine antennae, that was the amount we used. Occasionally, some of the regular antennae were replaced by additional antennae towards North America, when conditions to that area were exceptionally good. Not much new on the recording front; Mika relied mostly on minidiscs (Sony MDS-JE520 deck and a portable Sony MZ-R35), but had also a Pioneer CT-S330 cassette deck. Jim used portable cassette decks.